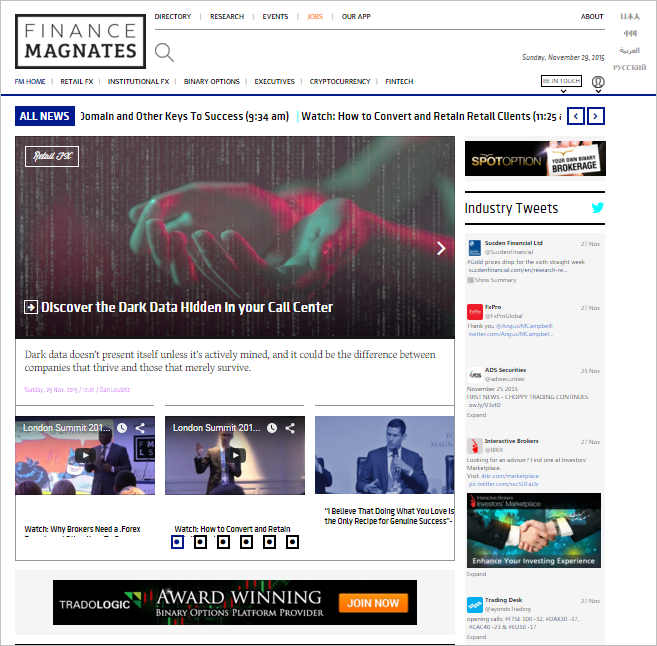 Finance Magnates (www.financemagnates.com) is the leading B2B content hub for finance and online trading news, research and events. 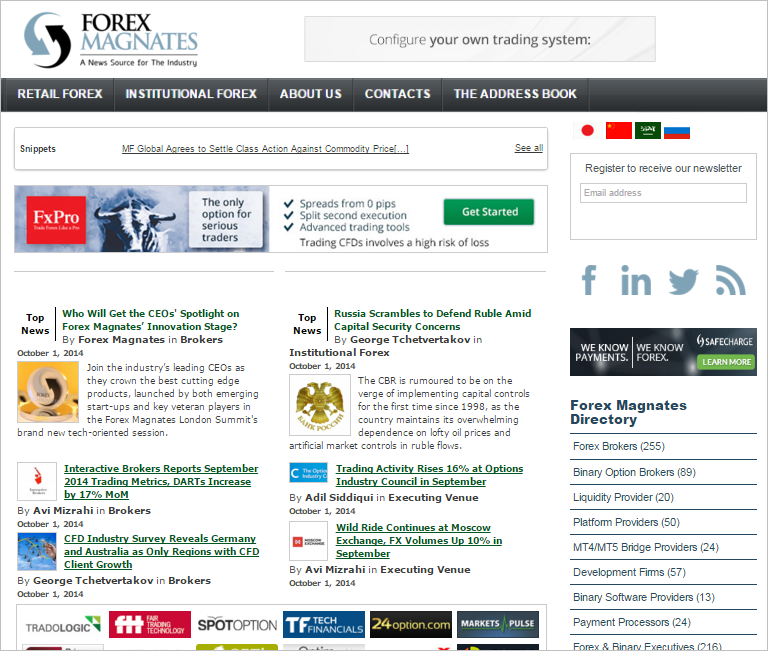 Having previously published B2B Forex news under the brand name ‘Forex Magnates’ (www.forexmagnates.com), the company approached Seperia ahead of their website restructure & domain change, rebranding and expansion to a broader finance strategy, which included the shift to a new brand name- Finance Magnates. To ensure a smooth migration to a new domain name and brand, making sure that the new Finance Magnates brand would sustain the well-known online brand authority of Forex Magnates, including substantial traffic from Google News search . To ensure smooth migration to the new domain with minimal loss in website traffic (not just organic traffic, but traffic from all sources). To ensure the ranked organic keywords of the new domain would maintain a similar ranking upon launch as the old domain. To keep all important technical elements and user data from the previous domain in order to preserve the continuity of Google Analytics data and to be able to compare both domains on the same metrics. To achieve maximum online exposure for the new Finance Magnates brand using a variety of online channels such as their new website, social platforms, Google News and more. Pre-existing technical issues on Forex Magnate’s domain made it impossible (initially) to map and crawl all of the existing data. The existing website was comprised of a flat URL database of over 10,000 pages, archived only by tags, for example: http://forexmagnates.com/strong-rebound-alpari-group-september-trading-volumes-increase-31-5-mom/. Following a thorough analysis of the existing website, our team had to determine the best possible way to build a new, SEO friendly dynamic website/ URL structure that would incorporate the categories under which content would be grouped (also allowing for new categories to be included in the future). We were also concerned with the mass redirection of all 10,000 pages from the previous domain to the new domain, including how to perform the redirects in a manner that would result in minimal traffic loss and maximum retention of the previous site’s authority. We had to perform the redirects in a manner that the user would be redirected to the most relevant corresponding news item in the new domain. Whilst developing the new URL structure, our team also planned how to widen the organic targeting potential of the new website. URL redirection mapping was performed- one-by-one – to provide Forex Magnates with a well optimized information and URL structure. To combat the technical issues, our team eventually had to use Finance Magnates’ database to perform a full mapping of the site and to ensure that 100% of the old URLs would be redirected smoothly to the corresponding page in the new domain. The results of such a restructure would positively impact organic traffic, by enabling more accurate targeting both for users and search engines. This would also enable the addition of new fields/ topics in the future (such as ‘Fintech News’ or ‘Stocks News’), thanks to a well optimized information structure. Seperia performed a thorough QA following the migration, to make sure the redirects were performed correctly, that content and pages were functioning (loading, linking etc.) as expected, to check the new pages were being indexed by search engines, that data was properly collected by GA, to monitor the Google News application and much more. After the new domain was launched, we faced severe technical and server conditions that badly affected the site’s loading time. This was problematic both for user experience and search engines. Another technical challenge, was how to maintain user IDs with the change of a domain name. To combat load time issues, we recommended and assisted Finance Magnates on a migration to a stronger server and CDN (content delivery network) services. Seperia also structured Finance Magnates’ Google Analytics (GA) account to efficiently track traffic and users on the new domain, making sure no data was lost during migration by keeping all users’ IDs exactly the same as they were in the old domain. Whilst planning the site migration, Seperia consulted with Finance Magnates to ‘rethink’ their target audience, to better acknowledge their position and accommodate a certain portion of their audience who were actually a B2C audience. As this expansion occurred, we were tasked with generating as many online brand citations for Finance Magnates as possible, to boost the new brand. Title Tags, Meta Descriptions and Headings were optimized to include the ‘Finance Magnates’ brand name. Internal and external links were changed to point to the new domain. Recommendations were provided for social channels, including the use of hashtags, descriptions and about sections. These recommendations were also aimed at increasing social activity to boost the brand during migration. Paid campaigns were also adopted to promote the new brand. All redirections were a major success, and within a few hours of the new domain launch almost 60% of the new domain’s URLs were indexed. Server issues that affected loading time after launch had initially prevented Finance Magnates from smoothly and immediately re-entering Google News (which was one of their biggest traffic sources prior to migration), although they were fixed in the following weeks. Finance Magnates’ content did eventually re-enter Google News, four months after the migration. Generally, a significant online shift- such as the domain change and rebranding of Finance Magnates- can result in a considerable loss in traffic to a site, sometimes up to 50%. The loss of traffic is due to major changes in rankings, technical issues and more. Seperia made sure that all controllable elements were managed as accurately as possible. This thorough work during the website migration led to only a 20-25% loss in traffic in the period immediately following the migration, which rapidly grew back to previous numbers and much higher (after a couple of months)! Finance Magnates SERP rankings initially dropped, but we have since seen big jumps in rankings- up to 60 positions higher in a couple of months. All user data (ID) was preserved. We only witnessed a 2-3% loss of data. We saw a huge improvement in user engagement metrics, such as average time on page, bounce rate and average page views (these metrics all almost doubled themselves).